Hwy 101 mile marker 235b. 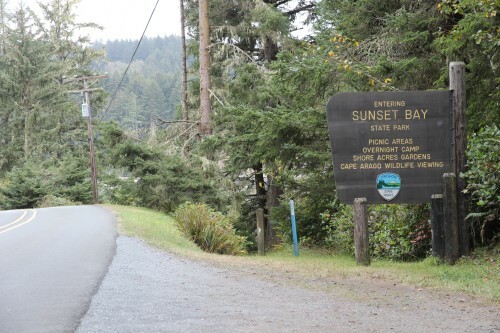 Sunset Bay is the second of five beaches, parks, and viewpoints on the "Charleston Loop". A few blocks after you cross the bridge leading into North Bend, highway 101 splits into two separate one-way streets. Soon after this you will come to Virginia Ave. There is a sign indicating a right turn for "Charleston - State Parks". It's easier to pass up this right turn and turn instead on Newmark street a few blocks further south. Newmark's street sign also has a separate sign labeled "High School - Community College". Turn right onto Newmark. It will soon become "Cape Arago Highway". Continue driving toward the bay. Just before the bay, Cape Arago Highway turns left. This highway is the "Charleston Loop". Note that further down, Cape Arago Highway turns right and you will immediately cross a bridge and enter Charleston. 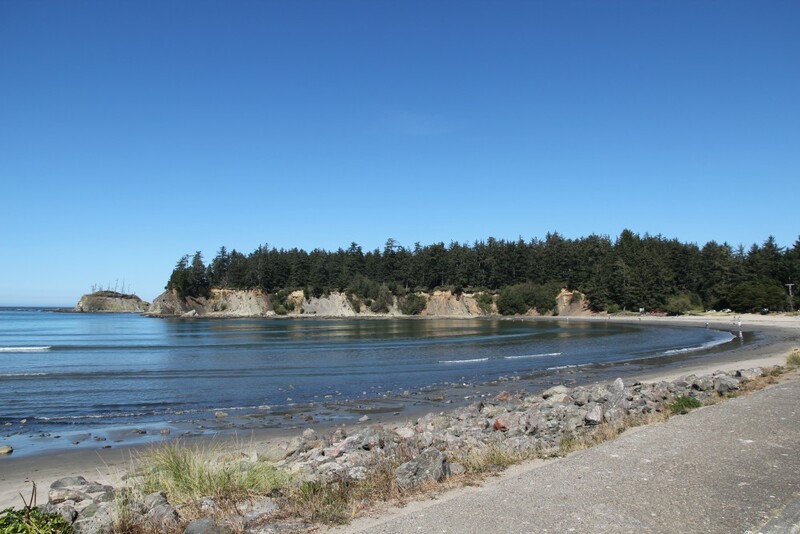 Continue on Cape Arago Highway to the five recreation areas. Site Resources: camping area, RV area, yurts, picnic tables, restroom, showers. A golf course is adjacent. 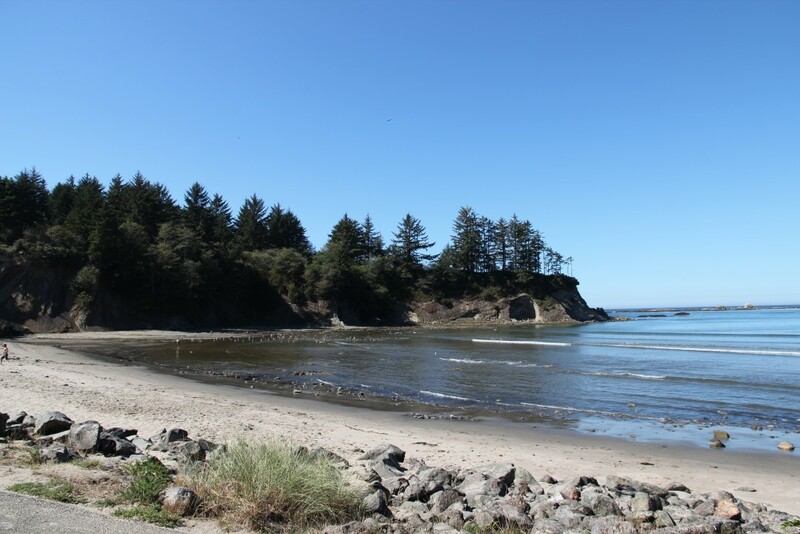 Oregon state parks link:Sunset Bay No fee required to visit the beach. You are looking here at the South side of Gregory Point, with Chief's Island at the tip. Hidden from view is the Cape Arago Lighthouse. You can take a somewhat distant picture of it from a trail that runs between Sunset Bay State Park and Bastendorff Beach. 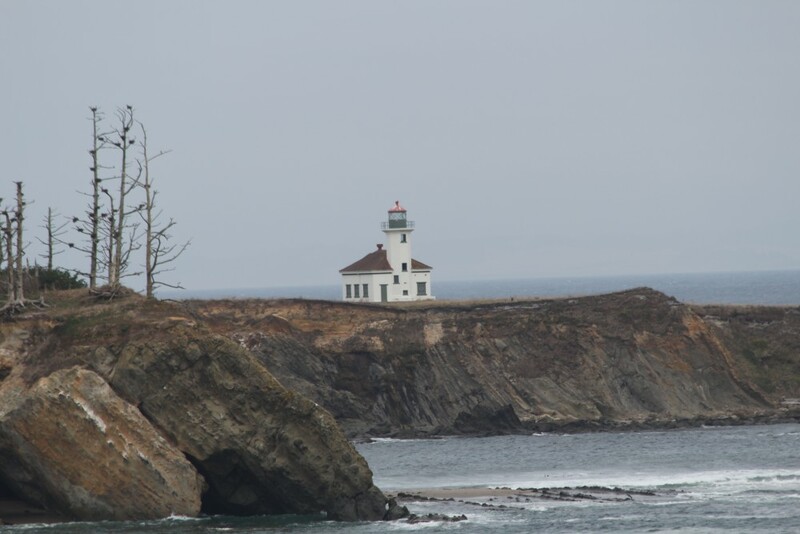 The lighthouse was transferred in recent years to the Confederated Tribes of the Coos, Lower Umpqua and Siuslaw. It is currently closed to the public, though may be opened at a later date. A view toward the South. You can see a cave at the end of the peninsula. Here is a zoomed-in picture of the somewhat elusive Cape Arago Lighthouse. 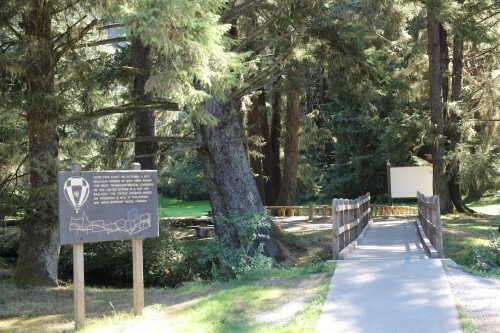 Note that there is a "Cape Arago State Park" on the Charleston Loop. It's at the end of the Cape Arago Highway. Note however that the Cape Arago Lighthouse itself is between Sunset Bay and Bastendorff Beach.